Spring heralds the beginning of many things, from the first blades of green grass to warm and sunny days. Most importantly, spring marks the birth of festival season. Coachella, the massive music festival known for its jam-packed lineups and outrageous fashion statements, is slated to set the season off during its two-weekend spectacle. The annual Coachella Valley Music and Arts Festival has a reputation, and not just for music. Celebrities and social media influencers from across the world come in their best summer festival garb, wearing as much -- or as little -- as they please. Though each year comes with its own trends and styles, Vogue has declared that the Ugly Shoe will reign this season. As the iconic magazine stated, the ugly shoe will be "a refreshing counterpoint to the ubiquitous crop tops and flower crowns." Pairing thick and chunky hiking boots, sneakers, and sandals with the bralettes and skirts of old is practical in the extreme -- but, in a way, that's what Coachella is all about: extreme expressions of fashion, music, and life. 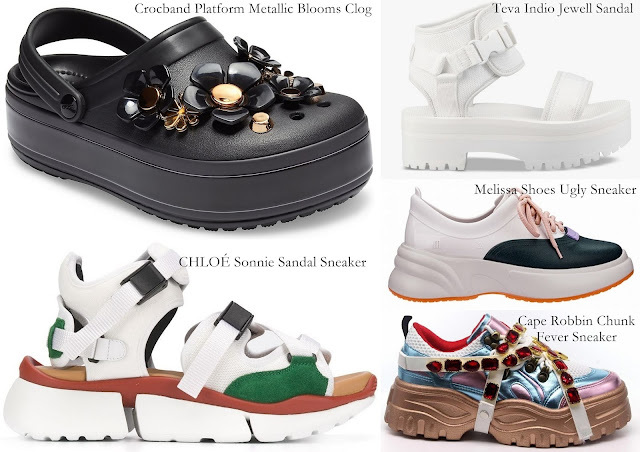 Vogue claims that wearing off-kilter footwear is ultimately about having fun and staying comfortable, and these classic ugly shoes certainly hit the mark. Take the CHLOÉ Sonnie sandal sneakers by FarFetched, which are precisely what they sound like; by combining the breathability of a sandal with the comfort of a sneaker, you get a particularly appalling shoe -- and one that costs $515 a pair. However, they are effortlessly captivating in a one-of-a-kind way. Since wearing heels for a two-day music festival in the desert would be impossible even if they were 'in' this season, the sheer ridiculousness of the sandal-sneaker ugly shoe seems to fit right in with the Coachella aesthetic. Women's apparel was the number one top-selling item on the Internet in August of 2017, and we're sure it will continue to rank as festival season gains momentum. The flexibility of the ugly shoe means that even those of us who aren't socialites will be able to get in on the action in some form or another; with a little Internet browsing, we can all find the ugly shoes of our festival dreams.